Since the death of Mei’s father, her ma has refused to keep animals on the family farm. So when Mei finds two baby chickens, she shares her delightful discovery with no one but her older brother Guo. Mei does her best to keep her new found friends a secret, but all does not go as planned. When Ma sells the chooks to the fearsome one-eyed butcher, their fates seem sealed. 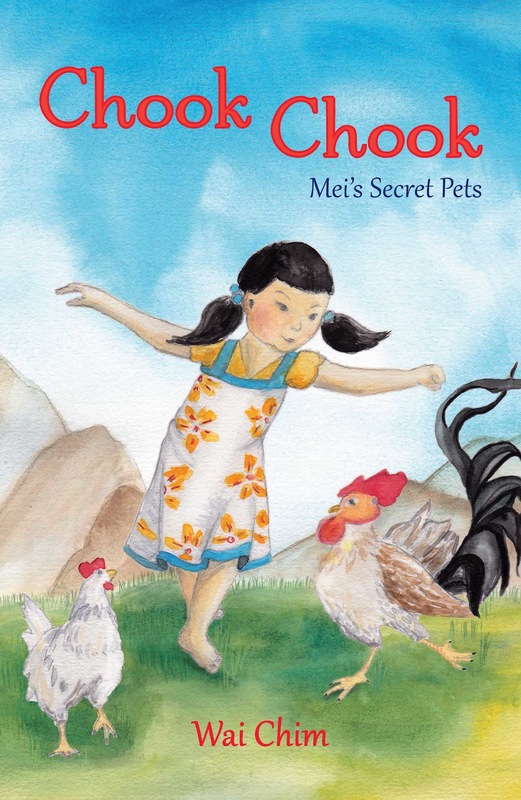 Is there anything Mei can do to save her beloved chooks from the butcher’s knife? A new book by first time author that fits in wonderfully with the ever popular theme of animals and pets. In the case of this book, there are no wild animals like alligators or tigers, but at the same time the pets in this book are not the run of the mill cat or dog either. The title alone gives it away, and if not that, then the illustration of the cover. This book is about ‘chooks’ or chickens to my non Australian readers. I used the term chook because I wanted to really bring a sense of familiarity for the young Australian reader. Even though it's a book about a girl in China and there are really strong cultural elements in her life, the way she thinks/acts/plays is a lot like any other Australian kid. The main story in this book is about Mei and her secret chickens. After her father’s death, the family got rid of the few animals they had on the farm so they could focus on growing rice. When Mai finds a pair of baby chicks, she knows that she has to keep them, but she has to keep them secretly. For a long while all goes smoothly, Mei plays with the chickens after school, she feeds them, and then she hides them away at night. When her mother finds out what she’s been up to, she takes the chickens to market. Mei is horrified at the thought of what will happen to her chooks, her horror is justified when she sees the chooks in a create at the markets, being sold by the butcher! The only way to get them back is to buy them, but Mei has no money. Surely in a busy market there is a way for Mei to make the money she needs? So we have a story of a girl who wants a pet, and isn’t allowed to, and the lengths she will go to, to make it happen. The other more subtle story is that of a family who have had to make changes to their lives because of the death of a father and husband. There’s the obvious change of getting rid of the animals, but there’s also Mei’s brother who works the farm after school and in his spare time, but who makes a decision that farming is what he really wants to do. Mei’s mother is also struggling to make sure there’s food on the table, and her children are looked after, the animals (which she was scared of anyway) were an added burden, and a reminder of what she had lost. All in all I would say this is a great read for those starting out with novels. It would also make a good class novel, as there are lots of point to be discussed. In fact UQP have already produced Teacher’s Notes for it, see the link below.